On these unique CD’s are the only known experimental stereo recordings of the NDO, made in 1960/61/63 and announced by the late Roger Moffat. The BBC was at the forefront of stereo recordings, even though professional stereo equipment was both rare and costly. Many talented and dedicated BBC engineers, mixers and producers were involved in the 60’s in pushing stereo recording technology to the limit. To my knowledge these recordings have never been heard in true stereo, because when they were broadcast, none of the FM transmitters were stereo capable, and use had to made of Radio and TV audio to achieve a form of stereo for the listening public. They sound superb. 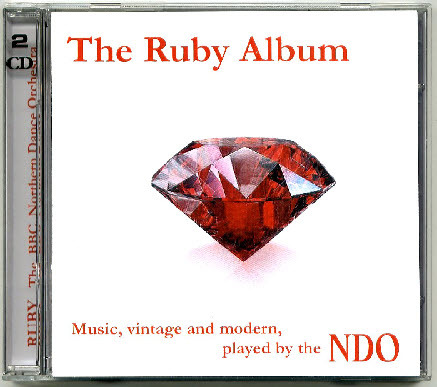 CD 2 is equally remarkable, since it contains some of the last stereo recordings the NDO made in1972 -74 before it was disbanded and became the NRO. The conductors during this period were Bernard Herrmann, Alan Moorhouse,and Brian Fitzgerald. We hope that you will enjoy these unique CD’s, produced at cost, and maybe see your way to sending a small donation via us payable to ‘Children In Need’ for Ruby and Pure Gold 1, ‘Nordoff Robbins’ for Diamonds, when you order.